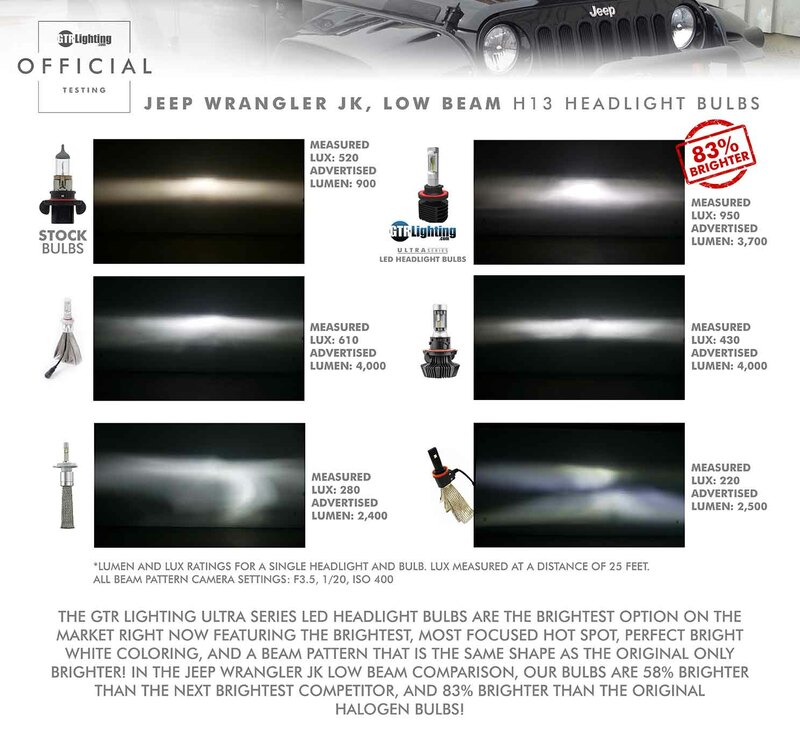 We've tested dozens of LED headlight bulbs for the Jeep Wrangler JK and generally speaking they are either less bright than the OEM halogen bulbs or they have weird beam patterns. Until now we couldn't offer an LED bulb upgrade that is any good. But now you can install the GTR Lighting third generation Ultra Series LED bulbs with built-in CANBUS integration, for a vehicle specific kit. The light output is brighter than the stock bulbs and has a better beam pattern! x2; GTR Lighting Ultra Series LED Headlight Bulbs. The third generation LED headlight from GTR Lighting. The new LED bulbs paired come with the kit are 83% brighter than the original halogen bulbs and 58% brighter than the next brightest LED bulb we tested! The GTR Lighting Ultra Series H13 LED bulbs really are the world's best bulb upgrade for the Jeep Wrangler JK! The GTR Lighting Ultra Series LED Headlight Bulbs are the brightest LED headlight and fog light bulbs on the market. They have a more precise beam pattern hot spot than any others, the fit more vehicle applications better than others, and they use less wattage, and less Lumen than others but create significantly more light! If you're not convinced, please click here to see our test results on OEM headlight housing applications! The Ultra Series LED bulbs feature super high quality LED chips from the Philips-Lumileds Luxeon Z ES family. This is one of the newest LED technologies on the market and allows us to create an LED array that most similarily resembles the original halogen bulb filament placed perfectly inside the headlight. This new way of thinking about how to use LEDs in a automotive headlight, paired with our exclusive reflector technology surrounding the bulb gives the GEN 3 Ultra LED the best beam patterns in the industry! These bulbs labeled "800/880" are interchangeable with these other bulb numbers, they are all practically identical: 880, 800, 892, 893. Projector Headlights: Generally speaking the best thing to use in a projector application is either a halogen (if it was designed for that) or an HID/Xenon bulb (if it was designed for that). Using an LED bulb will work on some halogen projector applications but chances are doing an HID conversion will yield better/brighter light than ANY LED bulb. The technology used in designing this LED bulb is based on mimicing the attributes of a halogen/incandescent bulb, so any halogen housing they should work but your results may vary. Click Here to see several vehicle-specific beam pattern demos . Adjustable Mounting Collar: Single Beam, Yes. Dual Beam, No. Input Voltage: Bulbs come in standard 12-18VDC input configuration, but for special orders we can make them 8-16VDC compatible for you.